My family and I had the time of our life at the 25th Anniversary. I personally was able to fullfil a life dream of meeting and getting autographs from individuals that I have admired since childhood. The whole event is hard to put into words. I could fill this page with a whole lot of adjectives, but to put it simply, it was magical. The cast and crew were wonderful and gracious in answering and signing anything that a fan presented to them. I loved to here the stories about how certain shots were done in the movie. The aspect that brought the whole event together was that it felt as if you were attending a small family reunion. That’s the key ingredient that made it special. Eddie and Martin are class acts; they went above and beyond anything that I had ever expected. 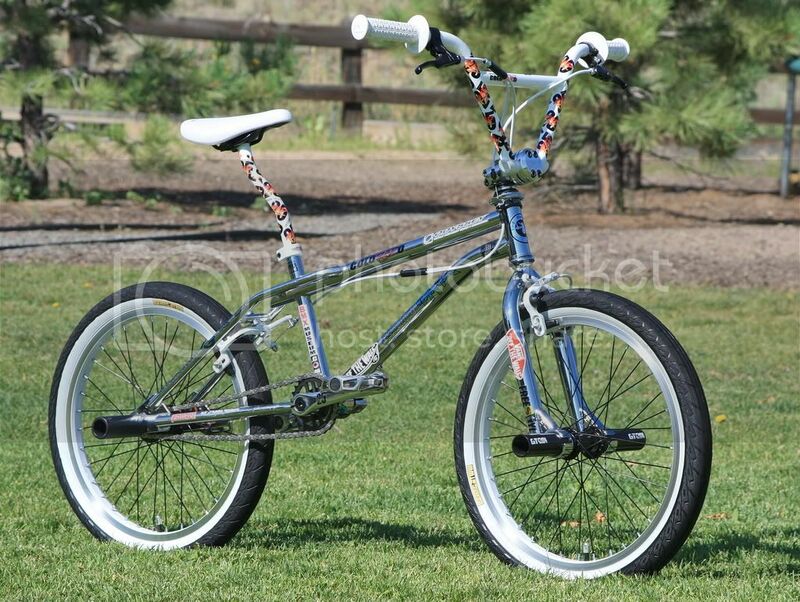 Your collection at the BMX Gallery: 4130 was sweet. I realized that we had a lot of the same items. I have never seen the Vans Rad stickers, before they looked cool. Thanks for all everyones hard work. Without it, none of this would have been possible. Watching Rad 25 years later in the theater with my brother and friends was even better than the first time in 1986. The energy from the crowd was intense and carried over into the next couple of days. We had a blast rolling around Cochrane with everyone. Thanks to Jeremy, Kurt, and Brenda for organizing an epic celebration. Just wanted to give you the heads up on how great the event turned out, the team did an amazing job putting this together. We are very proud to be part of RAD, 25 years ago until this day. I wanted to take this opportunity to THANK YOU for all your effort, hard work and extraordinary organization skills that were put into this celebration! Your dedication, perseverance and hard work speaks highly of your character. I have no doubt you experienced a great weekend, and I am certain everyone involved was pleased with the result, if anything, you made a mark in history. Well done Kurt! Kudos to you, your team, and the volunteers…for all your community spirit! I just wanted to say thank you to the organizers of this event and to EVERYONE who showed up and made it what it was, a once in a lifetime gathering of ace BMX'ers. I know I met alot of you guys here but I'm horrible with names, I did truly enjoy our ride from the movie house to the skatepark even if wired had a component failure, sorry I didn't notice sooner! The highlight of my weekend was actually having Bill Allen sit on my bike and have his picture made on it, then with me. I was just floored that I could get that picture. The ride in Cochrane with Eddie and the rest of the crew narrating at most stops was just insane! Nearly a 100 riders in the street of that small town was something to see. Jeremy for everything you did and for being so cool with our over enthusiastic autograph hunt.You've been a true gentleman, honorable and respectful.You let us be ourselves without any issues.I really can't thank you enough for allowing our dreams to come true. Really enjoyed meeting Eddie,Martain and the guys;specially Everett.A real cool cat. I'll write more soon,gotta rest as we just got home a few hours ago. Cheers,thanks and God Bless brother.Ya done good. I wanted to take a moment and put in my $.02 on the whole RAD weekend. I got to spend a lot of time with most of the people at the reunion, and the best way I can describe the whole event is that I truly believe we are lucky. We are lucky to be part of a sport that most of us got introduced to in the 80's, a sport that helped me learn the value of hard work, helped me learn what exercise really is, helped me stay away from drugs. Helped me have friends for life. We are lucky to have got to know people like Eddie, Martin, Woody, Mike D, Mat H, Brian B back in the day, we got to meet our heros. We are lucky that 25 years later, our sport is still going strong, thanks to website like this, x-games, you tube, etc. We are lucky that people like Jeremy Moser and his group care enough about the movie and the people to spend as much time and effort as they did to put this event together. In my professional career, I have put together some events of this size, and trust me it is not easy. I'm sure Jeremy and his group lost a lot of sleep, money, and time with his family to put this together. We are lucky that we have people like "Wired" - Kelly.... who spent a lot of his own time and money to fly a couple of thousand miles to Calgary, to document the entire event. Trust me, Kelly missed out on some things because he was documenting the event. But mostly we are lucky to have people like Eddie and Martin. I don't want to discount the other riders who were there (Kevin, Beatle, etc) but if you were not there, you wont understand how lucky we were to have Eddie and Martin at the event. I travel a lot in my job, and I don't remember meeting two people like Eddie and Martin. They must have signed thousands of autographs, took hundreds of pictures, and answered hundreds of questions, all with a huge smile on their face. During the bike rides in perticular, they were like kids out there, they were having so much fun, and really enjoyed being back in Calgary. Eddie and Martin must have slept all the way home, because I don't think they slept the entire weekend. It didn't matter if it was a 38 year old like my self or a 8 year old who was looking for their attention, Eddie and Martin made time for everyone. In summary for me, the actual movie stuff was awesome. Mr. Allen and Mr. Needham were so cool to meet (I got to take a piss with Cru Jones!) but for me, it was about the two riders, after all RAD was loosely based on Eddies life. I grew up with so many pictures on my walls, school lockers and binders of these guys that all my friends and family knew who they were. In fact my 72 year old English mother who met Eddie in 1987 said "How was that Eddie fellow? he was so nice when we met him"
Eddie, Martin, thank you for all you time and effort, not only this past weekend, but over the past 25 years. I'll admit that I didn't "get it" right off the bat. As I sat in an aisle seat in the front row of the Cochrane Movie House, I was trying to wrap my head around why exactly so many people had turned up to celebrate the 25th Anniversary of the movie RAD. I could appreciate how beautifully the BMX scenes were shot. My crush for Lori Loughlin—a crush I share with any male who grew up watching Full House in the early 1990s—reached a fevered pitch the moment I saw her driving down 1st Avenue and didn't let up until the closing credits. And seeing Cochrane in all its mid-1980's glory was certainly interesting. But there had been people stopping into the Cochrane Times office last week who had travelled from as far away as Atlanta, Georgia to celebrate the movie's anniversary, and for the film's first 45 minutes, I just couldn't wrap my head around why. It was right as the film's main character, a local BMX rider named Cru (I think I may just have found a name for my future son), was lining up at the starting gate for the final race of qualifying. The chant started quietly at first, just one or two people. But soon, the entire crowd was ecstatic and I was on the edge of my seat yelling along with them. From that moment on, I understood. RAD may not crack the American Film Institute's top 100 films list any time soon, and most people may not even know it exists, but for the people in that theatre on Saturday night, it meant something. The people who filled the Cochrane Movie House weren't appreciating RAD with some ironic hipster distance. No, the people I spoke with after the show had all discovered the movie at some point in the last quarter-century, and they had fallen in love with it. Whether it was seeing their favourite sport on the big screen, with some of the top athletes in mid-1980's BMXing shot in the beautiful Alberta light, or the simple story of a local guy beating the odds and becoming a hero, RAD had resonated with a lot of people over the years. And on August 20 in Cochrane, it was their night to celebrate. When the final credits rolled and the cast and crew took to the stage, the audience roared before settling in and giving them the chance to reflect on the time they spent in Cochrane filming. Bill Allen, who played the aforementioned Cru, was asked about how many of the film's BMX stunts he performed personally, and he didn't hesitate before answering. "Every single one of them," he laughed. "No, I can't do anything, I can barely stay on a bike and drive straight. That's why they had the best stunt riders in the world come in." Director Hal Needham then took the time to tell the story about how he chose Cochrane to film. He said he'd previously filmed Little Big Man in Alberta in 1969, and came up to scout locations around Calgary for RAD with the Calgary Film Commission. When he got to Cochrane, he called off the search. "They brought me out here and I just said 'this is it,''' he said. BMX Gallery 4130: Rad 25th anniversary - contest and party photos: More party. In their last stop before finals, Cochrane BMX athletes stepped onto the podium 40 times racing on their home turf Aug. 20-21. The series coincided with 25th anniversary celebrations of the BMX film RAD, taking place in town. Cast and crew from the cult classic took time to sign autographs and pose for photos at the track Aug. 20. Out of the Cochrane contingency, Sabrina Millman earned two gold medals in elite racing competition while brother Karsten earned two silver. In their respective expert divisions Holly Moores, Peter Verheyde and Steven Sweet topped the podium for gold while Heidi Moores and Lukas Becker nabbed silver. Becker also earned bronze at the expert level along with Emily Lucier. In novice competition, Riley May — in his first season of BMX — raced to two gold medals. Liam Hogg won novice gold and silver and Curtis Gammon won a gold and bronze. Caleb Pochailo, Faith Otterson, Kathryn Sachkiw, Devin Matthews, Tyler Penkoff and Dawson Hogg all took silvers in novice events with Jacob Heer, Heidi Moores, Mikayla Gale and Dane Coleman taking bronze. Intermediate gold went to Connor Murphy and Baird Evans with Steven Sachkiw and Joe Moores earning bronze. Alyssa Williams, Grayson Coleman, Noah Maisonneuve, Pete Maisonneuve, Noah Bean, Doug Murphy, Chantale Otterson, Malcolm Evans, Kaylee May, Devin Matthews, Perry Chirakorn and Joe Moores rounded up the Cochrane riders who had a great showing at the event. “We’ve got some pretty elite riders in our club,” Gammon said. Canadian BMX Association finals take place in Abbotsford, B.C., Sept. 3-4. Gammon explained to qualify for finals, riders need to complete five races including one out of province. Provincials will take place in St. Albert Sept. 9-12. Twenty five years ago, a quirky little movie about bike racing called RAD was made. Little did any one know that today it would develop a huge cult-like following. RAD was filmed primarily in Cochrane and Calgary in 1986. My husband and I moved to Cochrane in 1993, and our sons began riding BMX in 2000. Around that time we rented RAD and laughed as we saw our house in the background of the famous scene of Lori Laughlin teaching Bill Allen how to do jumps on his bike and land in a pile of bedroom mattresses. This all took place in McNamee Park on Mountain Street. We enjoyed the RAD anniversary this past weekend. We posted our “Welcome Back RAD” sign on our back fence for the cast and crew to see as they did their bike tour through town to all the film locations on Saturday. But first, Cochrane BMX was holding the #7 Western National Race so we headed up to the BMX track to watch. Next, we met the cast and crew for pictures, autographs and conversation. We saw the Norco Factory team, (still wearing their original jerseys), RAD racer and fellow Canadian BMXer Jeff Ingram, RAD director Hal Needham (who also directed Smokey and the Bandit), stunt doubles from the “bike dance” held at Cochrane High’s gym and, of course, heartthrob Cru Jones (played by Bill Allen) — as handsome as ever. After the race about 50 of the BMX race crowd descended upon our backyard for our annual after the race barbecue. Some of the families drifted to the Cochrane Movie House to watch the movie. At 7 p.m., some of the 17 year olds asked if they could watch RAD from the computer on our big screen TV. Over the next hour, we noticed several guests going into the house but not returning to the yard. We jokingly said they must have been sucked into the “vortex of RAD.” Sure enough, we checked and soon everyone was draped over chairs and couches mesmerized by RAD. 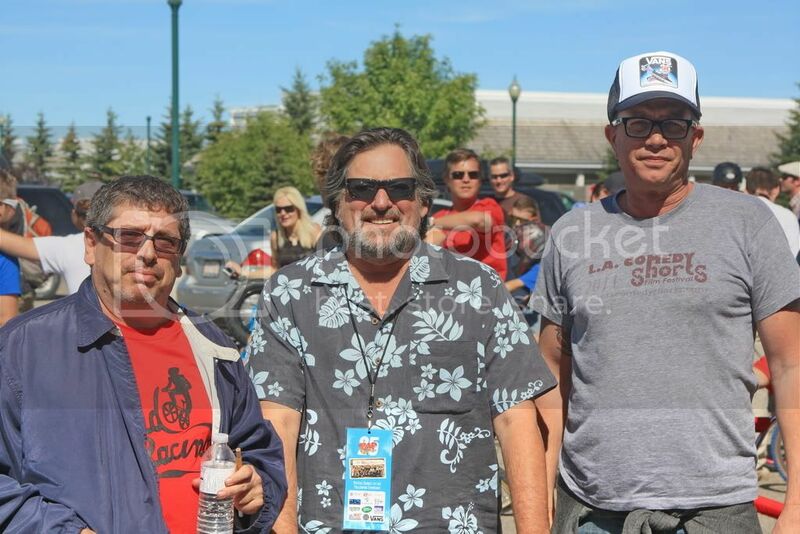 When festivities kicked off on Aug. 19, it had been a little over a year since Jeremy Moser of themovierad.com, Brenda Lieberman of the Calgary Underground Film Festival and I had initially discussed the idea of a 25th anniversary celebration for the BMX movie RAD. In the months to follow, even though there seemed to be a positive vibe in the air, we were completely oblivious to how the event would actually be received. The seats in the Uptown Theatre in Calgary rapidly filled, and the moment the word “RAD” appeared on the big screen the place erupted. I peered behind me to see a theatre jam-packed with RAD enthusiasts in standing ovation. It was at that moment we knew our efforts had culminated into a huge success. On Aug. 20, the Cochrane BMX track and skate park was crawling with an overwhelming number of people for two separate competitions: an on-bike filming location tour through Cochrane, pedalled by nearly 200 followers of all ages, and a sold out evening screening at the Cochrane Movie House. Bill Allen, who played main character Cru Jones in the film RAD, signs the jersey of Noah Maisonneuve of Cochrane BMX Aug. 20. Photo by Jeremy Broadfield. 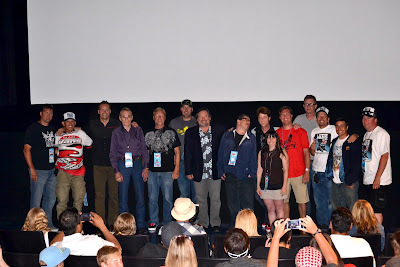 The screening was followed by a question and answer session with director Hal Needham, writers Geoffrey Edwards and Sam Bernard, producer Robert Levy, actors Bill Allen and Jamie Clark and BMX riders Eddie Fiola and Martin Aparijo. Also in attendance were Kevin Hull, Jeff Ingram, Kirk Bihun, Pat Lipovski, Beatle Rosecrans, Everett Rosecrans, Jeremy and Matt Moser, who all rode in the film. 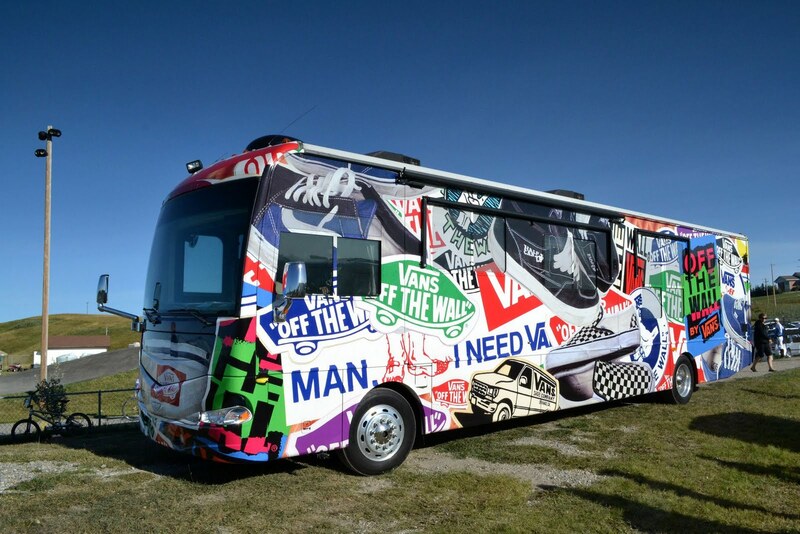 Other anniversary highlights included the VANS gang making the road trip from Southern California to serve waffles, hot dogs and hand out schwag. The RAD documentary crew — also venturing from California — spent the weekend on location conducting interviews and collecting footage for an upcoming release. The anniversary must also be seen as a huge success for the Town of Cochrane. Our community opened its arms to RAD celebrities and fans alike who travelled from throughout North America and as far away as Australia. A special mention needs to be made to Aleksandar and Tonya Trbovic who travelled outside of their home country of Serbia for the first time to take part in the celebration. Many of our guests made sure to comment on Cochrane’s aesthetic beauty and outright friendliness of our residents. The cast, crew and BMX riders from RAD who came to Cochrane and Calgary were an absolute pleasure to work with. It was a very emotional weekend and it is virtually impossible to express how extremely fulfilled I am with the successes of the festivities. On behalf of our organizing group, I would like to extend our most sincere gratitude to those who provided continual support from beginning to end. An event was created that, in the end, was way larger than any of us had ever dreamed. Without our sponsors, the cast and crew, volunteers and most importantly the fans, this would not have been possible. It was a pleasure and an absolute honour to bring this to our community and I hope to see everyone here when it is time to celebrate 30 years of RAD. In the "It's so easy, it's a joke" category, local pro Darcy Peters won the Get Rad skatepark contest in Cochrane this weekend as hundreds of BMXers from across North America gathered in Cochrane and Calgary, Alberta to celebrate the 25th anniversary of the movie RAD. Peters had good runs full of huge, flowy airs with technical tricks thrown in for good measure. In a scary moment, Peters dropped in for his last qualifying run and slammed at the bottom of the bowl. A little bit shaken up, some guys helped him out and after collecting himself, proceeded to whup everyone in the finals. Besides the contest, which was heavily attended by scores of BMX racers, street riders, and even flatlanders, the weekend contained a plethora of other activities to keep the RAD vibe going. The movie screening(s) in both Calgary and Cochrane were many people's chance to see the only legal 35mm copy of the movie RAD on the big screen. Question and answer sessions turned into flatland sessions. The Cochrane BMX track was visited by the entire rad crew as many guys stayed to sign autographs and pose for pictures with young and old fans alike. BMX Gallery:4130 hosted the RAD museum and opened their doors all weekend to all of the visiting Bmx scenesters. There were two bike rides, one in Cochrane, and one in Bowness, that toured various filming locations of the movie. Sunday's tour in Bowness featured tour guide and BMX legend Eddie Fiola who enthusiastically spoke about each filming location to a group of 50 or more bike riders who joined the tour. Martin Aparijo summed up the weekend best by explaining that the reunion was just part of life as a BMXer. After 25 years or more, BMXers are still getting together by travelling around the world, meeting with friends and having a good time riding their bikes. In 1985 Martin, Eddie, and dozens of other industry-leading icons took part in the making of the movie RAD, and they were happy to share their experiences with the lucky folks in Calgary the past weekend to celebrate one of the most influential BMX movies of all time. We had a blast; with special thanks to all the sponsors, volunteers, organizers, riders, and movie makers. But a huge thanks to the fans that came out to enjoy this awesome event. Please visit this site as we pull together all the photos, videos, and stories right here. With 2011 marking the 25th anniversary of the seminal '80s cult classic BMX film 'Rad,' devoted fans of the film are flocking to Calgary and Cochrane, Alberta this coming weekend for the Rad 25 anniversary celebration. Presented by the Calgary Underground Film Festival, 'Rad' fan site themovierad.com, as well as the Towns of Cochrane and Calgary (where 'Rad' was filmed in 1985), the anniversary celebration will include a 'Rad' memorabilia museum, a BMX museum, tours of the shooting locations and more. Additionally, this weekend's upcoming festival will feature screenings of the film on the only legal copy of the 35mm film in existence. 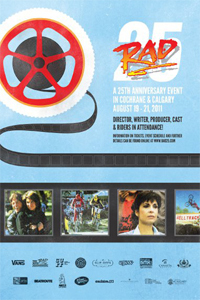 Beginning Friday, the Rad 25 celebration begins with a BMX gallery that includes an assortment of poster art from the movie and the opening of the 'Rad' museum, then moves into screenings, which will be attended by cast and crew from the movie, including Bill Allen (who played Cru Jones) and Hal Needham (director). The event continues Saturday with events at the Cochrane BMX track, Cochrane skatepark, bike tours of filming locations, additional screenings and an afterparty. Initially, a documentary on the movie 'Rad' was scheduled to debut at the Rad 25 festival, but according to the filmmakers, the documentary is still in production and no official release date has been set. Mongoose Bicycles recently signed on as a sponsor of the documentary. Released in 1986 and directed by Hal Needham, 'Rad' charts the meteoric rise of a BMX riding paper boy named Cru Jones, who through hard work and determination, rises up to beat national BMX race pros on a track dubbed "Helltrack." The film additionally featured freestyle riding and acting parts from major BMX race and freestyle pros, and has appeared on the pop culture radar through TV shows such as "Tosh.0" and "American Dad." Kelly, thanks for sharing this, and we look forward to seeing you on it next week. Sweet ride.